Min Pro Crisps are a result of 60 years expirience in fish food making. 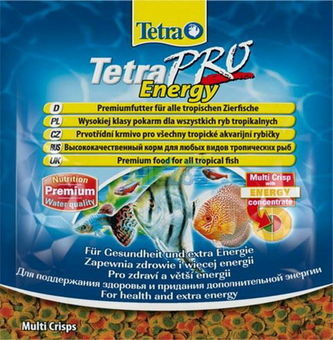 Defining excellence with yet another unique blend of ingredients, these Pro Crisps ensure that your fish are at top health all year through. It's suitable for all tropical fish. Min Pro Crisps are extremely nutritious and have been developed under a new low-heat process which ensures that the goodness of each crisp stays locked inside the food until it is consumed by your fish for maximum impact. Min Pro Crisps also contain a patented active formula which maintains a healthy immune system with a clean and clear formula which also produces less waste inside the tank. This benefit allows you to enjoy the beauty of your tank for longer without the added concern of additional cleaning requirements after feeding time. The product is provided in an air tight tub which protects the food from air, moisture and light damage.